Like driving, cooking often requires the need to change speeds. Heat is to cooking what power is to an engine, and any driver who wants to use that engine to get from point A to point B needs to have control over the car, just as a chef needs control over cooking equipment. Shifting from full speed to comfortable cruising should be effortless and efficient. For these reasons, gas burners have always been preferred by professional chefs. Gas is no longer the only cooking option in the kitchen, though. Induction cooking is an alternative that offers the same amount of power and control but with important advantages. Induction cooking is based on a completely different principle. Instead of generating heat, it creates an electromagnetic field that 'induces' it in a pan. While in traditional cooking, the heat comes from the electric hob or the gas burner. With induction cooking, the source of heat is the cookware itself, as long as its material has strong magnetic properties, like stainless steel, cast iron, and carbon steel. No external heat source means less thermal dispersion and much higher energy efficiency than gas. Induction cooktops are also safer, as there's no risk of getting burnt by accidentally touching them. 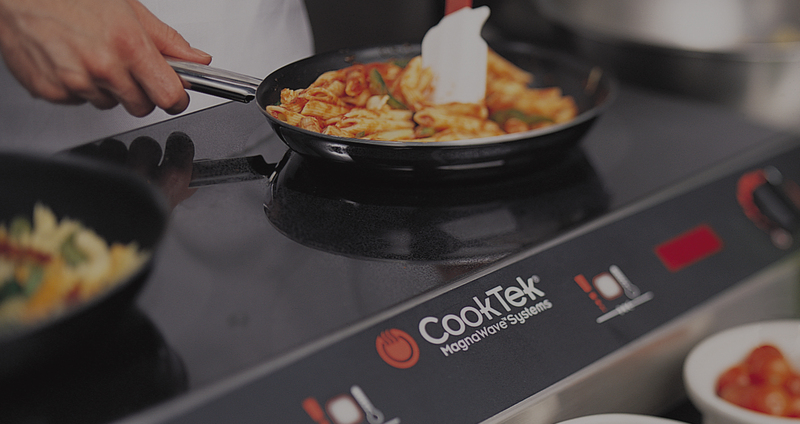 CookTek elevated induction cooking to the high standards that foodservice professionals in Florida require. Its induction line includes cooktops ranging from one to six burners, plus models specifically designed for stock pots, woks, cast-iron skillets, or for grilling food directly. CookTek induction systems are 94% efficient, meaning that 94% of the energy consumed is delivered to the pan. This is unmatched by gas (typically 35%) or traditional electrically-powered cooking devices (typically 50%). As a result, induction cooking devices release less heat into the room, use less fuel, and save energy. Induction cooking is here to stay. It’s earning its place in the foodservice industry, and deservedly so. It saves energy and creates a less hot (and healthier) working environment, while offering the amount of cooking power and control that professionals need. Learn more about induction and the full line of CookTek induction cooking equipment. Schedule an equipment assessment with your friends at Eaton Marketing. © 2019 Commercial Foodservice Equipment Solutions | Eaton Marketing Florida.